Tantya Tope (1814-1859) also known as Ram Chandra Pandurang, was an Indian leader in the Indian rebellion of 1857. Born in at village Yeola in Maharastra, he was the son of Pandurang Rao Tope, an important noble at the court of the Maratha Peshwa Baji Rao II. His father shifted his family with the ill-fated Peshwa to Bithur where his son became the most intimate friend of the Peshwa’s adopted son Nana Dhondu Pant (known as Nana Sahib) and Maharaja Madhav Singhji. In 1851, when Lord Dalhousie deprived Nana Sahib of his father’s pension, Tantya Tope also became a sworn enemy of the British. In May 1857, when the political storm was gaining momentum, he won over the Indian troops of the East India Company, stationed at Kanpur (Cawnpore), established Nana Sahib’s authority and became the Commander-in-Chief of his forces. 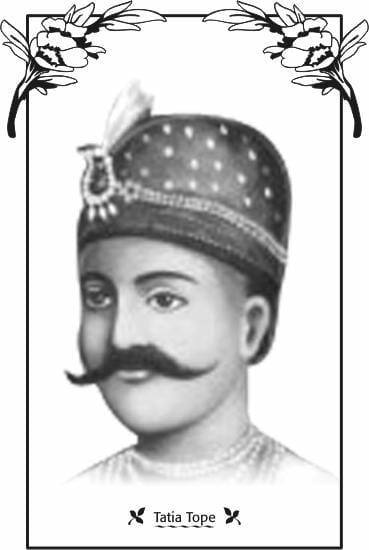 After the reoccupation of Kanpur and separation from Nana Sahib, Tantya Tope shifted his headquarters to Kalpi to join hands with the Rani Lakshmi Bai and led a revolt in Bundelkhand. He was routed at Betwa, Koonch and Kalpi, but reached Gwalior and declared Nana Sahib as Peshwa with the support of the Gwalior contingent. Before he could consolidate his position he was defeated by Hugh Henry Rose, Ist Baron Strathnairn in a memorable battle in which Rani Lakshmi Bai was killed leading her forces against the British assault on Gwalior. After losing Gwalior to the British, he launched a successful guerrilla campaign in the Sagar and Narmada regions and in Khandesh and Rajsthan. The British forces failed to subdue him for over a year. He was, however, betrayed into the hands of the British by his trusted friend Man Singh, Chief of Narwar, while asleep in his camp in the Paron forest. He was captured and taken to Shivpuri where he was tried by a military court and executed at the gallows on April 18, 1859. There is a statue of Tantya Tope at the site of his execution near present collectorate in Shivpuri town in Madhya Pradesh.